In August of 2017, I had the amazing opportunity to take a 3 week trip to Scandinavia. During that trip, I spent nearly a week north of the Arctic Circle. What follows is the story of my wild, and often unexpected experiences in arctic Norway. After spending 2 days in Bergen, Norway, I was finally getting used to the new time zone. I made sure to head back to the airport early to catch my flight from Bergen to Bodø. In Bergen, the public transit is run by an app that links to your cell phone number, except at some of the major transit hubs where they have kiosks. Because of my wireless carrier's international rules, the confirmation code that I needed to buy my bus ticket wasn't sending to my phone. So I would have to walk or take a taxi, 5km to the train station to get to the airport. Thankfully, I left myself enough time to save some money and walk. So I trudged across the bridge that split the section of the city I was in, with my fully loaded 65-liter backpack as well as my 24-liter daypack. It was also raining and a cool 55°F. Arriving at the Byparken Light Rail station in the city center, I bought my ticket and boarded the train as it was about to leave. It is about an hours ride to the airport from there, so I spent the time people watching. Norwegians can be quite shy so it was interesting to see the different ways that manifested itself in the people. When I got to the airport, I was still about 20 minutes early for check-in on Widerøe Airlines. Bergen International Airport is a beautiful airport with efficient security and check-in processes. Proceeding through security, I grabbed breakfast which consisted of a croissant, some reindeer sausage, and brown cheese. This was among my favorite breakfasts that I had in Norway. I heard them call for my flight, so I made my way to the gate and boarded a surprisingly crowded regional flight. As I settled in for the 3-hour flight north, I tried to read but was ultimatley too distracted looking out the window at the glaciers, snow-capped mountains, and famous fjords of coastal Norway. Upon landing in Bodø, 80km north of the arctic circle, I left the arrivals area of the airport for a few hours before my helicopter to the remote island of Værøy. This was my first helicopter flight, so I was reasonably excited. Yet again, this flight was surprisingly crowded; there were 6 of us not including the flight crew! After an uneventful flight, we landed in Værøy. The heliport staff was kind enough to call a cab for me so I didn't have to wade through the freezing rain to get to my Airbnb. On the 18.6 km2 island, there are less than 700 inhabitants. So, to my surprise, there are no proper addresses to tell the cab driver. When I told him I was visiting Rita, my Airbnb host, he misunderstood me and took me to a different place entirely. It wasn't much of a detour, but enough to give me a bit of a chuckle over the pronunciation of Rita's name (in Norwegian, the "r" get's rolled and the "ita" is rushed) and no extra charge on my fare. Rita greeted me outside with a smile and showed me to my flat. She gave me a quick rundown of the island and also some suggestions for hikes, but explained that they can be dangerous in foul weather. It was getting a bit late and I was exhausted from travel, so I turned in early. The sun didn't set until after 9pm, which threw my internal clock off a bit, so I decided to turn on the TV. My first taste of Norwegian television consisted of "Nobel" on NRK, about the Norwegian military in Afghanistan, and an interesting show called " Alt for Norge" on TVNorge, in which Americans of Norwegian heritage, travel to Norway and compete through a variety of challenges, for a chance to be reunited with their distant Norwegian relatives (check out the links for a taste). I eventually fell asleep and looked forward to my next few days in Lofoten. The main points of interest on this trip. The next morning, I trekked out to wander the "downtown" Sørland area. It's little more than some houses, a school, a church, some town offices, a grocery store/cafe, the ferry docks, and lots of racks for drying fish. Once the grocery store opened, I grabbed a coffee at the cafe and watched as the locals lively discussed the gossip of the day, before stocking up on some essentials in the store. By this time, the wind had picked up significantly more than I had imagined it could. 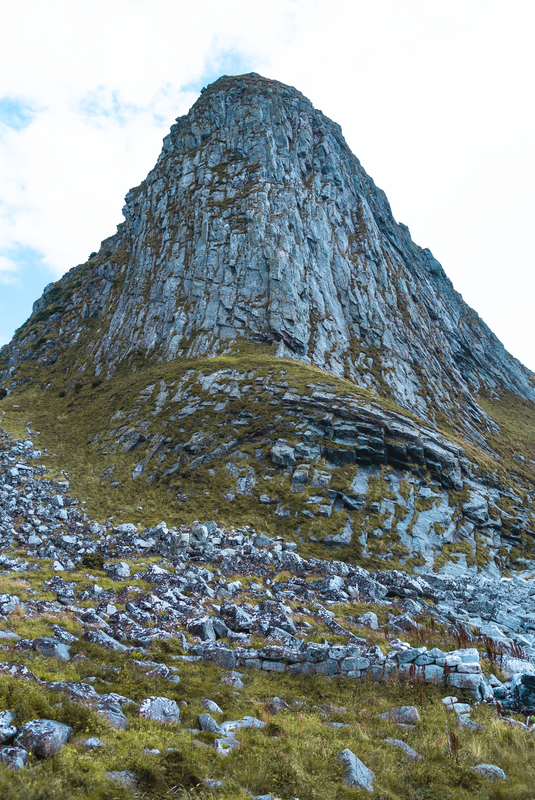 I walked back to the flat, put my groceries away, and headed back out to attempt a hike of Værøy's highest peak, Nordlandsnupen, a looming precipice that sticks out of the island like a ship's mast. It's a scenic walk along the inhabited tundra. Once I reached the high point of the valley that led to the northeast of the island, the wind nearly blew me off of my feet. I was stubborn and wasn't about to let some wind stop me from my hike, so I leaned into the wind and haphazardly marched down the road. The wind didn't let up at all, making the relatively short, downhill walk, feel like it dragged on for ages. The wind in Lofoten is unreal! Reaching the base of the mountain, it sheltered me from the wind significantly, so I ventured down to the white sand beach, stripped my boots and socks off, rolled up my pants and stood in the arctic waters for a while as the waves crashed into my legs. It was as peaceful as this island could me. Though, it turned out to be a false sense of security. To give you some context, it was about 40°F without the windchill and was constantly misting a mix of rain and blown ocean water. I started on the trail to make my way up the mountain. After walking along some time, passing some ancient stone walls, I was actually blown off my feet in the slick grass. I had to decide whether I wanted to continue up, as I was traveling alone, or turn back, appreciative of all I had seen already. I decided on the latter. It turned out to be the smart choice as the weather proceeded to get worse by the time I reached the road again. With the wind at my back now, I held onto the guardrail along the road and hiked back to Sørland. I was disappointed that I wouldn't make it to the mountain, but I made the most of the time I had on my hands and walked around the less windy areas of the island. I planned on hiking Nordlandshagen to the village of Mostad, the next day. This place looked absolutely beautiful. Sadly, come morning, the weather didn't shape up for that either. The rain on that part of the island was horrible and I was unable to find any other travelers on the island that I could hike with for an added level of safety. So, I continued to explore the Sørland area all day. 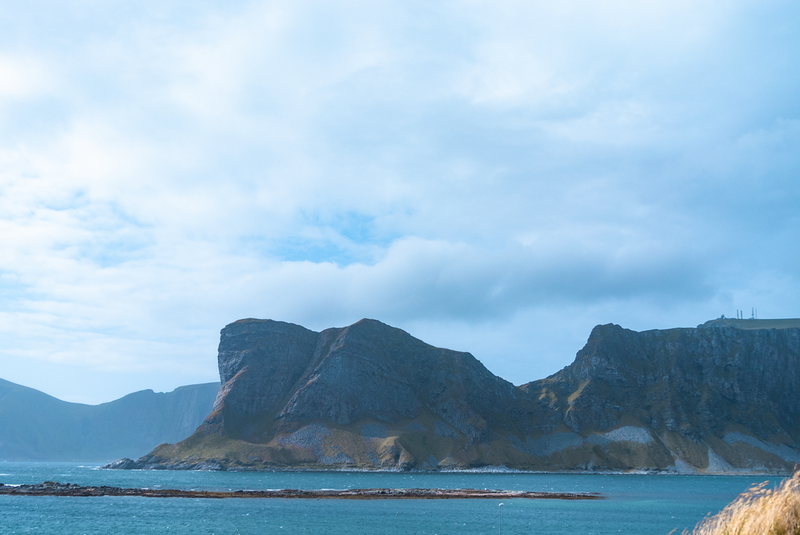 I was boarding a ferry to the main area of Lofoten in the morning. This is a place that defies words and has a beauty that is unsurpassed. It was all waiting for me there as a consolation prize. After getting back to the flat, Rita knocked on my door and informed me that the weather was going to be even worse than they had been, for the next 3 days and all the ferries were canceled. I would have to evacuate by helicopter to the mainland first thing in the morning if I wanted even the slightest chance of getting to Lofoten. I immediately jumped online and booked my seat on the only helicopter off the island for the next 3 days. As I straightened out my room before bed, I heard the winds picking up and the rain and sleet hammering the windows. Once it finally arrived, we boarded quickly according to our very recent training. Now, I've been on my fair share of bad flights, but this one took the cake. The winds made for a harrowing flight back to Bodo; the helicopter was bouncing around like a martini shaker, and we were the martini. It was nauseating at best, but we made it. The pilot clung to the scattered islands that dotted the way back to the mainland, much more than they did on the way to the island in the first place. It was a bit disquieting to see the near panic on their faces during the many moments when the aircraft dropped 10 feet or so, seemingly for no reason other than the terrible weather. After landing back on the mainland, and thanking God I didn’t puke in the helicopter, I hailed a taxi to the hostel downtown that I had booked a bed in. All ferries to Reine via Moskenes had been canceled for the next 3 days, so I resigned to explore Bodø until my flight back to Bergen in 3 days time. The hostel was charming; perched above a train station near the docks for all kinds of ships. It was quite small compared to other Hosteling International locations I had visited, but far from unwelcoming. Being at the tail end of the summer, the hostel was manned by students from Romania and the Czech Republic making some extra money between terms, rather than locals. I checked into my room; an average sized room with 5 bunks (10 beds) and a bathroom and settled in for a quick and rare nap. There was only one other person in the room when I fell asleep, but when I woke up, there were 6. I honestly just laid there for a while. I was disappointed that I wasn’t going to visit the part of Norway that I wanted to visit the most, I was tired, and I was annoyed that the hostel was busy and that I had to share the space with so many people. My time in the military got me used to being in dorms like this, but my adventure that was supposed to be largely one of solitude quickly brought me into the metropolitan side of the Arctic. The weather outside wasn’t particularly friendly to just wander around in, so I stayed in bed for a while; playing Candy Crush if I remember correctly. I turned in for the night without dinner. The next morning, the room was pretty much empty and a quick look out the window showed that the weather here at least, was less hostile. So, I googled a café and walked a few minutes up the road. I had a Norwegian waffle with jam and a cappuccino. After breakfast, I wandered the area a bit, discovering the shopping mall which was hosting a large political action day (their presidential elections were approaching quickly), showcasing all of the major parties and candidates. I discovered even the president of Norway herself was there when I walked up to a random woman and asked what was going on. I found out speaking with other people there, that the woman was Erna Solberg herself! I got back to the hostel and decided to nap a bit again. When I woke up, one of my roommates, who I guessed was a bit younger than me, struck up a conversation about our dormmate who shouted regularly in his sleep. He introduced himself as, Nerijus, an expat from Lithuania who lived in Lofoten now. He was studying at Nord University in Bodø and he offered to show me around the area a little bit. We went to the grocery co-op and grabbed some dried fish (Tørrfisk; a staple in northern Norway), some Kinder Bueno bars, and a tall can of Isbjørn beer for each of us. All together it cost me just over 180Nok ($22USD)! I’m not a big fan of fish, but the dried fish was quite salty and nice. It’s an interesting process that you can get a quick glimpse of here. After a while, Nerijus invited me to grab a dinner with his classmate, Anine who was from Oslo and staying in the female dorms. The three of us went to a pizza parlor not too far from the hostel called Orion. It exceeded my expectations, which were honestly not very high at the time. We returned to the hostel and hung out in the common room for a little while before going to bed that night. In the morning we all went to breakfast in the train station together; more meats and cheeses with some fruits. I was getting used to these Norwegian breakfasts. We all went our own ways for much of the day as they had some work to attend to at the school, so I wandered a bit more. The shopping mall was having a Star Wars celebration to build hype for the “highly anticipated” new Star Wars film. Simpler times when “The Last Jedi” was a film people actually got excited for! So I stayed and watched the Stormtroopers teach little kids blaster protocol and enjoyed seeing all of the cosplayers wandering around. I treated myself to some Elderflower sorbet (still the most delicious sorbet I’ve ever had), and called my family back in America, and really tried to immerse myself in the feeling of the city. When I got back to the hostel a little while later, I regrouped with Nerijus & Anine and we went back for more pizza, which wasn’t cheap at all, so we split it. We hung out more in the common room and Nerijus and Anine told me they were leaving in the morning to go home. The ferry had been resumed to Lofoten and Anine had her flight back to Oslo, but all good things must come to an end. We decided to make a memorable final night together and went to a local club to play some pool. We paid our cover and got our wristbands for drinks (which we didn't have because of the prices), then went to the pool tables. The club was dark and moody, not unusual for a club, but there was a band playing tonight; a Viking-metal band that the crowd seemed to really be a fan of! While we dorks played pool – terribly mind you – the crowd was head banging and moshing to the band. It was a very Norwegian experience. After a few rounds of pool and the band had finished, we walked back to the hostel in the nearly constant arctic drizzle. My new friends both left pretty early in the morning, and my flight back to Bergen was not until the next day. I spent my last day in the Arctic, wandering the shopping mall, checking out another day of the Star Wars event at the mall, ate more delicious sorbet, and walked along the coast looking at the incredible mountains to the north and on the islands off the coast. When I woke up on my final day, I decided to walk to the airport. The chilling drizzle was coming down, but that didn’t stop the locals from walking around still; I saw more than one mother pushing a stroller and plenty of joggers – unfazed by the constant rain. It was about a 5km walk, but it was pleasant and relaxing to be alone with my thoughts after a trip that did not go according to plan but was far from a bust. The rest of Lofoten will be there for a future visit, and Bodø will be well worth visiting again for sure, but this trip was still really special. My biggest takeaway was that if you’re open to whatever comes your way, you can truly enjoy any situation, regardless of how unexpected or disappointing it is on the surface. You can make new friends, experience culture in ways that you may not have originally expected, try new things, maybe meet a president, and most importantly, make memories that – even a year later – are still as fresh as the day they were made.